RadScheduleView provides the option to visually mark the current time in the TimeRuler and across the Appointments area through its ShowCurrentTimeIndicator property. In order to display the current time indicator, you must set the ShowCurrentTimeIndicator property of the RadScheduleView as in Example 1. Running the code from Example 1 will result in RadScheduleView with current time marked as shown in Figure 1. TimeRulerArea – the default value, the indicator is shown inside the TimeRuler. AppointmentsArea – the indicator is shown only through the Appointments panel. WholeArea – the indicator is shown on both the TimeRuler and Appointments panel. Figure 2 shows current time marked across the whole area of RadScheduleView. You could change the look of CurrentTimeIndicator by setting the CurrentTimeIndicatorStyle and CurrentTimeIndicatorAppointmentsAreaStyle properties of the ScheduleView. CurrentTimeIndicatorStyle is applied to the part of the CurrentTimeIndicator in the TimeRuler, while CurrentTimeIndicatorAppointmentsAreaStyle is applied to the part in the Appointments area. Example 3 demonstrates how both Styles are defined and Example 4 shows how the Style properties should be set to the ScheduleView. 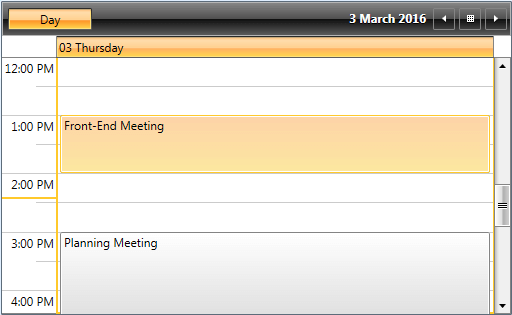 If you run the application at this stage, you will see RadScheduleView with CurrentTimeIndicator styled in different colors as shown in Figure 3. Additionally, you could set the AllowCustomSize property of the CurrentTimeIndicator in order to allow rendering elements with bigger size. For example, if you need the part in the TimeRuler area to be thicker, you can customize the CurrentTimeIndicatorStyle as shown in Example 5. Running the application will lead to the result shown in Figure 4. For more advanced customizations, see the ScheduleView Custom CurrentTimeIndicator Style example in our XAML SDK Repository.